EDMONTON - Alberta's governing Progressive Conservative party got off to a rocky start Friday in its first foray into picking a new leader by electronic vote. Party members looking to phone in or register their vote online faced long delays, blank screens, busy signals, lost PIN numbers, or mix-ups matching them to the master voting list. By midday, the Progressive Conservative party help line was so overloaded, it sent out a plea on Twitter asking voters to call back in two hours. "I have a ton of volunteers on the phones, and we're trying to navigate people through whatever issues they encounter," said Thomas Lukaszuk, one of three candidates vying to be the province's next premier. "We're trying to encourage those who have gotten discouraged by the process to come back and cast a vote." Lukaszuk said time spent helping people vote has taken away from efforts to get the vote out. He wouldn't speculate on whether the problems will hurt his campaign. "I will withhold any premature judgment," he said. But he said he would've preferred the traditional paper ballot method. "I'm sort of fashioned that way, but that wasn't my choice." Candidate Jim Prentice also said the glitches were having an effect. "They're impacting the campaign right now in terms of extra pressure on our volunteers and the work that's being done to help people get through the system (to vote)," said Prentice. "But we're well resourced with manpower and really committed volunteers so I'm optimistic that we'll be able to get our vote out as we planned." The third candidate, Ric McIver, and PC party executive director Kelley Charlebois could not be immediately reached for comment. Frustrated voters aired their beefs on social media, including with a Twitter account titled PC leader fails. Some responded with humour: "Just voted for '404 Error - Page Not Found' for PC leader. I think he's totally cruising to an early lead," wrote Zain Velji on Twitter. "Elections in Iraq have been better executed," tweeted Brad Ferguson. Some reported they had no problem voting, and urged others to remain calm and carry on. "People in some countries get shot/jailed for trying to vote. Those inconvenienced a few minutes take a breath," tweeted Parker Hogan, an Alberta government ministry spokesman. Under the system, voters with a party membership receive a 20-digit PIN code and also use the numbers in their postal code to vote virtually. Lukaszuk, McIver, and Prentice are vying to replace former premier Alison Redford as party leader and premier. Voting began online and by phone Friday and will be supplemented by in-person voting on Saturday. The results will be announced Saturday night at the Expo Centre in Edmonton. If none of the three candidates have a majority of votes Saturday, the top two finishers move to a second and final run-off vote on Sept. 20. 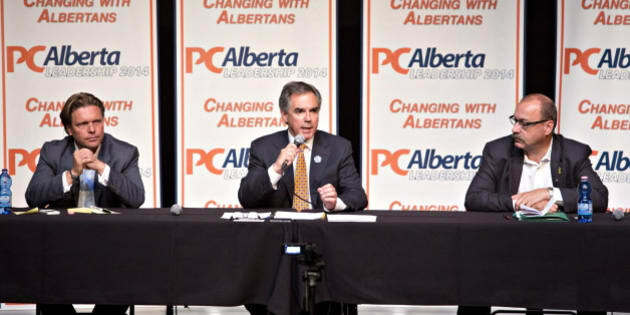 Should he win, Prentice has indicated he will quickly call a byelection to gain a seat in the legislature. Opposition parties don't always strongly contest such byelections as a courtesy to an incoming rival leader. But on Friday, Wildrose leader Danielle Smith said Prentice will enjoy no such honeymoon. The Wildrose has long accused the Tories under Redford of inflicting petty slights, including cutting the caucus off from routine government announcements. "A party that doesn't deliver the courtesies to the opposition shouldn't expect that they can invoke protocol when it's convenient for them," said Smith. "We'll be fighting tooth and nail." Aside from that, said Smith, there is a larger issue at play. "This (would be) really a mid-term vote to have Albertans say what they think of the progress of the PCs so far." The only empty seat is Redford's in Calgary-Elbow. However, PC backencher Neil Brown has also offered up his seat in Calgary-Mackay-Nose Hill.